The RSS Chief, Mr K.C. Sudershan, has blamed the electronic and print media for overexposure of violence in Gujarat after the Godhra incident and said the role of media and country was shown in bad light on international level. The remodelling of the Ambala cantonment railway station today seemed to turn into a challenge for the authorities since a heavy girder, which was being dismantled, collapsed on two platforms blocking the tracks this evening. Railway personnel remove the girder at the Ambala Cantonment railway station on Sunday. Mr Justice V.K. Bali, a Senior Judge of the Punjab and Haryana High Court, hinted here last night that court would take measures against people who file false complaints in courts. He wanted that strong laws should be made to curb this rising tendency among the people. The RSS Chief, Mr K.C. Sudershan, has blamed the electronic and print media for overexposure of violence in Gujarat after the Godhra incident and said the role of media and country was shown in bad light on international level. The RSS Chief who was addressing an invited gathering of intellectuals from different parts of Haryana here today blamed the newspapers published from Delhi of being biased against the Gujarat Government and the Chief Minister, Mr Narinder Modi. He also blamed the Indian and foreign press for not highlighting the plight of Hindus who were victims of violence and being shunted out from Bangladesh and Pakistan and the Kashmiri Pandits who were forced to leave their homes from the Kashmir valley. He said such people were leading a miserable life in different parts of India. Mr Sudershan said on the contrary the minoritiy communities, including Christians and Muslims, were living with dignity and honour with political and religious freedom in India. He took to task those political parties which were raising a bogey of being anti-minorities against the RSS and said they were weakening the country by their policy of appeasement towards minorities specially the Muslims to get their votes and capture the political power. He said the policy of appeasement had cost the country dearly as 1.20 lakh km of Kashmir was still under the occupation of Pakistan and China. The RSS Chief said granting of special status to Kashmir under Article 370 was another mistake of Jawahar Lal Nehru. Mr Sudershan laid stress on setting up of small industries and checking of migration of population from rural to urban areas. He also warned against the over exploitation of natural resources and said such a tendency was responsible for of pollution of the environment. Justice J.V. Gupta in charge, North Zone, Mr Darshan Lal Jain, in charge, Haryana and Major Kartar Singh (retd), sehsarsngshchalak, RSS Haryana , Mr M.L. Grover, district Sarsanghchalak, and other senior RSS functionaries were present on the occasion. Earlier addressing the RSS volunteers on the first day of the three-day session here last evening, Mr Sudershan alleged that a large- scale infiltration of foreigners continues from across the Bangladesh border in Assam and other North- East states, which was endangering the sovereignty and integrity of India. He said this infiltration had been taking place for so many years and the successive Central Governments, Assam and other states in the North-East had miserably failed to check this illegal entry of Bangladeshies. Although the collapse of the girder did not significantly hit trains traffic, the busy platforms No 1 and 2 could not utilised. The personnel who were working on the remodelling project escaped unhurt and the incident did not pose a risk to trains since the traffic on the two platforms was blocked well in advance. The Divisional Railway Manager, Ambala, Mr Deepak Krishan, said no one sustained injuries in the incident. “A girder slipped while it was being dismantled. It is a part of the remodelling project of the Ambala cantonment railway station,” he said. “We expect the train traffic to normalise by late evening. The trains will be delayed by about five to 10 minutes each,” he added. A visit to the railway station showed that the area where the girder had collapsed was cordoned off. 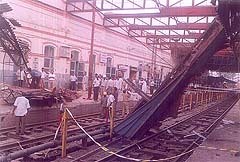 A number of railway personnel were busy in trying to remove the girder from the tracks. A railway offical said a tower wagon had already been pressed into service. “It runs independently and it will enable speedy rectification of the overhead electric lines. Also, it must be stressed that there has been no damage to the rail track,” he said. The official stated that the traffic on the platforms No 1 and 2 had been stopped before the work of dismantling girders began. “This incident took place at about 4.30 pm. We immediately swung into action and the process of clearing the girder was promptly initiated,” he said. Mr Justice Bali was presiding over a seminar on “Assault on medicos” organised by the Karnal chapter of the Indian Medical Association at Hotel Jewels. He said those who filed frivolous complaints against doctors should be given exemplary punishment. Mr Devender Singh, Deputy Commissioner of Karnal, was of the view that the rise in the number of cases against doctors was the result of awareness of the people of their rights. Dr Amrit Lal Bambah, chairman of the legal cell of the IMA, said the government should evolve ways and means to put an end to the harassment of doctors by undesirable elements. The medical profession was full of stress and if the doctors were not allowed to work in a tension-free atmosphere, they would not be able to give their best to their patients. Dr Naresh Kaushal, president of the Karnal chapter of the IMA, asked the doctors to do self-introspection. He said if the government provided protection to doctors from harassment, they would perform better. Dr S.L. Verma, national chairman of the IMA (AMF), stressed that doctors should soften their attitude towards poor patients.